A news anchor caught making obscene gestures while news bulletin becomes a controversy. 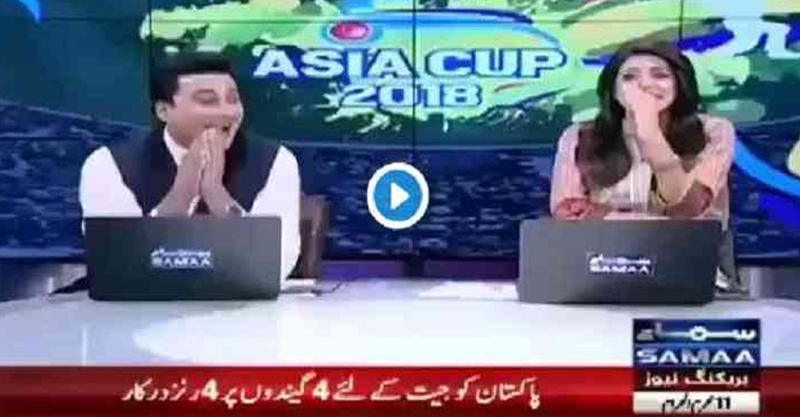 A news anchor of a Pakistani news channel was caught making an obscene gesture during a news bulletin on the Asia Cup 2018 Super Four clash between Pakistan and Afghanistan on Friday. The television anchor seemed unaware of being on-air and broke into a little dance, waving his middle finger at the camera. Pakistan eventually won the match against Afghanistan by three wickets. The video is doing the rounds on social media platforms. Pakistan registered a nervy win over Afghanistan in a nail-biting Super Four contest.Chasing a modest 258, Pakistan were in control with a 154-run second wicket stand between Imam-ul-Haq (80) and Babar Azam (66) before losing their way with the fall of regular wickets, only to be rescued by former skipper Shoaib Malik’s belligerent 43-ball unbeaten 51. After a win against Afghanistan, the Green Brigade suffered a nine-wicket loss at the hands of India, their second on the trot against Rohit Sharma’s men in the ongoing tournament. Chasing an average 238-run target, Rohit and Shikhar Dhawan single-handedly dominated the Pakistani bowling attack to add another defeat to the Sarfraz Ahmed-led side. With a win against Pakistan, India has booked a spot in the final. Pakistan will be facing Bangladesh in a do-or-die clash on Wednesday. The winner between Pakistan and Bangladesh will face India in the summit clash of the tournament on Friday.